Gardeners are some of the people most likely to have real survival skills – it could be the dirt effect or something. Gardeners can move to a remote area in the woods, grow their food and keep warm during winter. Before the age of apps, people used their hands for survival – not that they don’t today. The generation of machines is here with us, but there is always something good about doing things the old-fashioned way like splitting wood to keep the fireplace running. Talking of wood splitting, you will need the best splitting wedge to get the right size of wood fuel to keep the fire burning as you tell stories and enjoy the company of each other. So that’s the topic of discussion in this article. A wedge is merely a wood spitting tool typically inserted into the cracks of the wood with the goal of splitting it into several pieces. It is triangular-shaped and works efficiently as you drive it into the wood – some may use a chainsaw instead. If you are a history buff, then you will notice the close similarity between a splitting wedge and the earliest axes. There is an uncanny resemblance in terms of shape and uses. The only thing that the Acheulean handaxes from about 500000 years ago lack are a handle and of course steel. There have been several improvements since then, and the current wedge is more efficient. The most common tool used to split wood is the ax. However, there are some pieces of wood just too tough for the ax – you may have encountered some of them. Some people just leave them and move on to others. It is in such a situation that you call in the Calvary. The right tool for the right job when the ax has called it quits is obviously the splitting wedge. What makes the wedge easier than an ax to use is because you just need to find a crack in the wood and force it in. Splitting almost comes naturally as the cracks travel along the grains. You drive the wedge with a slash hammer. If you have ever used an ax, you will find a wedge pretty easy to use. However, the very green to such physical activities will find it tasking. And such physical activities as using a wedge put your body to practice. It makes you productive and healthier. A wedge will build up some steam and burn calories that have been piling up. The material: if you are into tree felling, then your best bet is a wedge made from heavy-duty plastic. This type of wedge will not damage the chainsaw should there be some contact. However, they are not long lasting and will need replacing after a period of use.You will also find wedges made from forged steel. This material is durable and achieves a certain level of efficiency. Yes, your first choice would be forged steel wedges, right? But hold your horses!The preferable wedges are those made from soft steel – yes, soft steel! 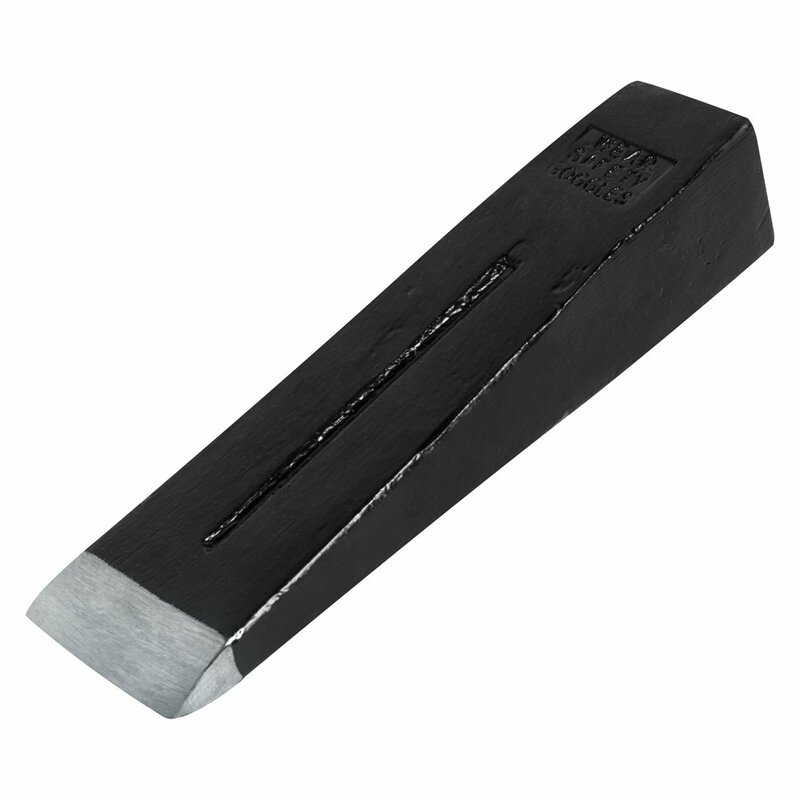 Those that tend to dent when hammered continuously are better than forged or even plastic.Well, soft steel wedges extend the life of steel mauls or mallet. They will not get away with a piece of your more expensive ax head since their resistance is less. Design: the splitting wedges are robust and durable. Anything that would break after several strikes with the mallet is not worth the effort. A durable wedge will easily take hits from the hammer and still maintain its shape. Weight: if you are splitting larger and harder logs, then you will need a heavier splitting wedge. Basically, the ideal weight is between 5 and 6 pounds but heavier if your logs are more massive. Brand: if you want something quality, then it is essential to buy from a reputable manufacturer. The idea is that a company known to produce quality products will still deliver quality. In splitting wedge and ax circles, such names as Fiskars, Garden, Ames, and Estwing are mentioned quite often. Shape: the majority of wedges are triangular, but you will also find flat, as well as, round splitting wedges. The circular and triangular are more efficient than the flat ones. You will even come across the grenade with a pointed edge – this can split the log into four pieces in one swoop.The diamond shape works best when the wood is already split open but needs an extra push to blast it open.You may be thinking that a sharp wedge is better than a blunt one. That is not the case. If it gets too sharp, there is a risk it can bite into the wood and get stuck – this would be terrible! Ames is known for their commitment to quality products. This wedge is both durable and safe – it will not chip or bend when using it. The wedge has a sustainable design that easily takes any amount of industrial use – which is a good thing. And when you compare the price to the quality, you can easily say that it is a bargain. This product is made of forged steel meaning that it will easily take continued hammering without chipping or bending – this is usually a problem with some other cheap wedges. Estwing is another company that produces good quality wedges. This is one wedge designed for the stubborn wood. It will split through knots and other stubborn parts of the log. Its total length is 9 inches – adequate to reach far and split the wood. The wedge carries a revolutionary design making it efficient on any part of the wood. Its double fin feature makes sure the tool does not get stuck in the wood. Another great thing about this product is that it stands alone on the wood without the need for holding. This is another wedge made of high-grade steel which is both durable and long-lasting. It comes with a rust-resistant wedge, and so it can easily take the battering from the elements. 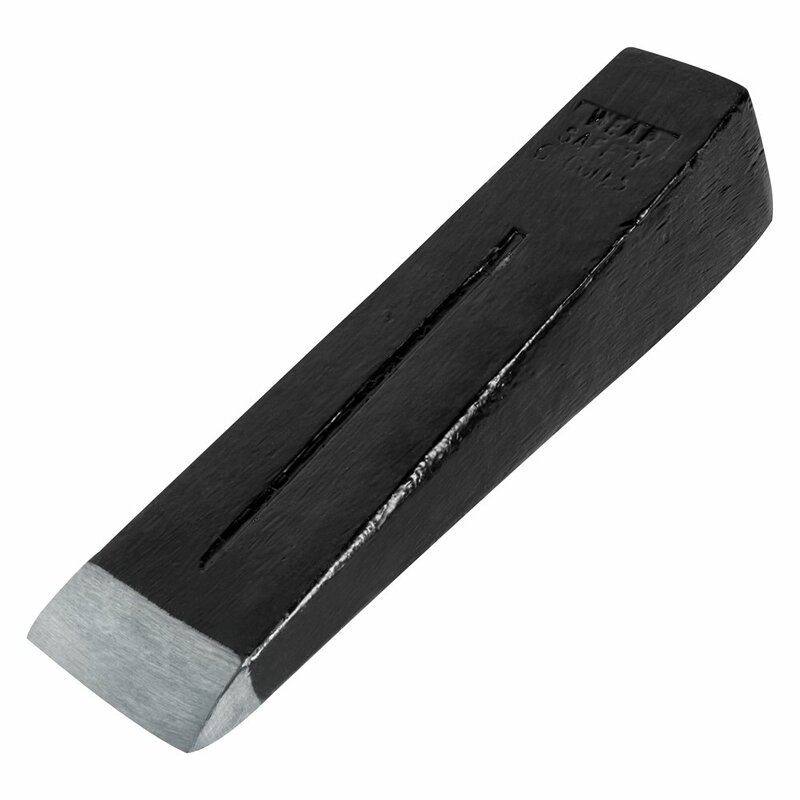 The wedge is black and with a silver edge that penetrates the wood easily. It is one versatile tool as it can chop any type wood with ease. And to top it all, the wedge has a great pointed shape that works well and doesn’t need sharpening. This is another great wedge from Ludell that demonstrates a high level of quality. It is made of high-grade steel that will not bulk under pressure from the maul or mallet. Well, the recommended weight for a wedge is 5 of 6 pounds. 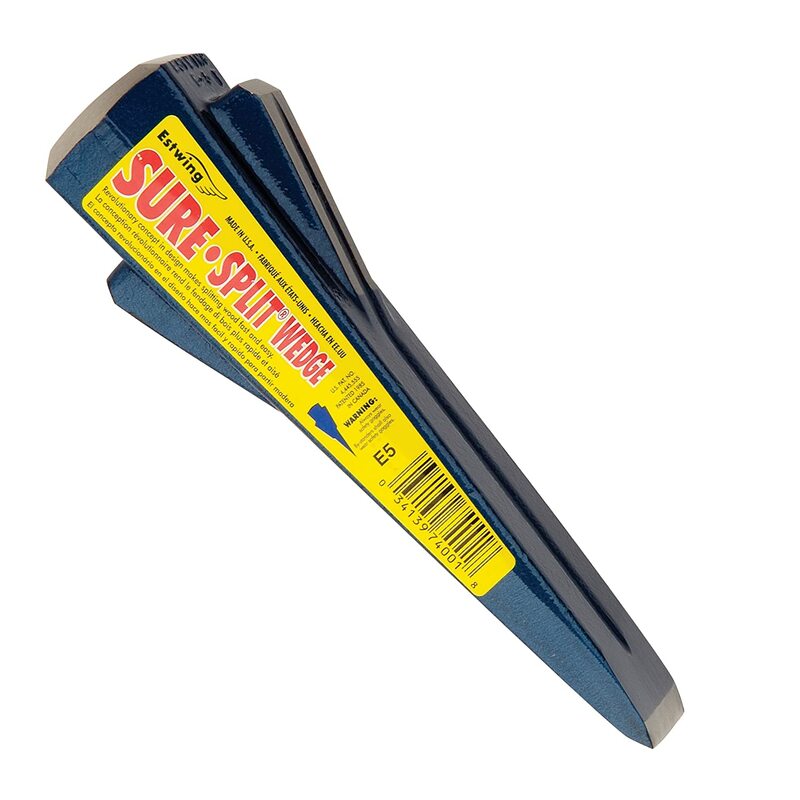 However at 4lbs, the tool is easy to use – you can easily transfer from one spot to the next. As mentioned earlier, Ames is a quality-making brand when it comes to everything wedges, axes and the like – and so you will not be making a mistake choosing them. This wedge is torpedo-shaped and so and can easily split the wood into four pieces at a go – talk of making your task easier. It is red in color and easy to spot among the dry leaves on the ground. Quality and the efficient wedge makes all the difference when it comes to wood splitting. As a matter of fact, the right wedge splits even better than an ax and makes your task much easier. However, the best wedge must easily withstand the pressure associated with constant hammering. Our top choice from the above review is True Temper 5-Pound Wood Splitting Wedge – 1132600. This wedge from Ames is made from forged steel and does not bend or chip easily – it is up to the task. It is durable and will give you a significant amount of service years.